James Robertson portrait attributed to Henry Benbridge. 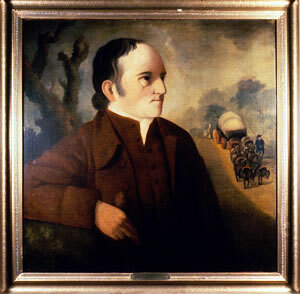 James Robertson, early leader of both the Watauga and Cumberland settlements, has been called the “Father of Middle Tennessee.” Born in 1742 in Brunswick County, Virginia, he was the son of John and Mary Gower Robertson. Physically, Robertson stood close to six feet tall, with dark hair, blue eyes, and a fair complexion. All descriptions of his personality point to an individual who was soft spoken and even-tempered, a person who maintained an inner composure regardless of external circumstances. Charlotte Reeves, who married Robertson in 1768, admired these traits. The daughter of a minister, Charlotte Robertson also persevered under the harsh frontier conditions and established a reputation for resourcefulness and strength. She and Robertson had thirteen children, two of whom died in infancy. In late 1769, as Robertson grew increasingly frustrated with the provincial rule of North Carolina Governor William Tryon, he became intrigued by the stories of the land west of the Appalachian Mountains and began to consider relocating his family there. Late that year, he crossed the mountains and found a suitable site in the upper Holston Valley near the Watauga River. To establish his claim, he planted corn and built a corncrib and a cabin. On the return trip, Robertson became lost and wandered aimlessly for approximately two weeks before hunters directed him across the mountains. Encouraged by his favorable description of the land, several of Robertson’s North Carolina neighbors decided to accompany him to the new frontier. In May 1772, when the Watauga settlers met to establish a government, they selected Robertson as one of the five magistrates to lead the Watauga Association. In addition, he was elected commander of the Watauga Fort. In 1777 Richard Henderson of the Transylvania Land Company purchased a large tract of land from the Cherokees, including most of what constitutes present-day Middle Tennessee. In the spring of 1779 Robertson and a small party of Wataugans, acting on behalf of Henderson’s claim, traveled to a site along the Cumberland River known as French Lick. There they selected a suitable location for a new settlement. Late that same year, Robertson returned with a group of men to prepare temporary shelter for friends and relatives, who planned to join them in a few months. The men arrived on Christmas Day and drove their cattle across the frozen Cumberland River. Crude cabins were erected for immediate winter housing, and a fort was built atop a bluff along the river. The fort was named Fort Nashborough, in honor of Francis Nash, who had fought alongside Robertson at the battle of Alamance in 1771. A faction of Cherokees known as the Chickamaugas opposed the Transylvania Purchase and warned the new settlers that trouble would follow their claim to the land. Attacks on the Cumberland settlement lasted several years and reached a peak between 1789 and 1794. Robertson’s brothers, John and Mark, were killed, as were his sons, Peyton and James Jr. Another son, Jonathan, was scalped. Robertson narrowly escaped death on two occasions. Once he was shot in the foot while hoeing corn. Another time he was ambushed along a trail and received gunshot wounds in both wrists. In 1790 Congress created the Territory South of the River Ohio, and Robertson became lieutenant colonel commandant of the Mero District. The following year, President George Washington appointed him brigadier general of the U.S. Army of the same region. Under Robertson’s guidance, the settlers worked together and persevered. Eventually attacks on the community decreased, and the population rose with the arrival of new settlers. As the Cumberland settlement entered a period of prosperity, the Robertsons built a comfortable brick home. Occasionally, Robertson acted on behalf of the federal government to assist in the treaty negotiations with various Indian tribes. In 1804 he was commissioned U.S. Indian agent to the Chickasaw and Choctaw Nations. His final mission took him to the Chickasaw Agency at Chickasaw Bluff. In his seventies, Robertson made the trip during heavy rains that forced him to swim several swollen creeks along the way. As a result, he became ill and died on September 1, 1814. His remains were later returned to Nashville, where he received a formal burial in the City Cemetery.